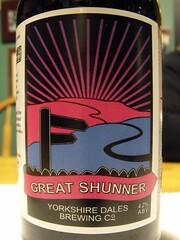 The last beer on Saturday was the second Yorkshire Dales beer I have had. 4.2% very dark colour with a poor head, the aroma and taste are bitter chocolate, very ordinary. Great Shunner Fell is the third highest mountain in the Yorkshire Dales, North Yorkshire, England.